Do You Want Korean Beauty Products To Revolutionize Your Skin? - Ingredients Matter! Everyone has their opinion about Korean skincare products. How do they achieve such perfect results? Do they contain a magic potion? Korean beauty products are spreading worldwide fast! K-Beauty is gaining a massive amount of attention, as well as creating a lot of myths and half-truths at the same time. You wouldn’t just eat anything, even if it was toxic, would you? Well, it’s the same for applying beauty products to your skin! It’s vital to know exactly what you are buying and using. 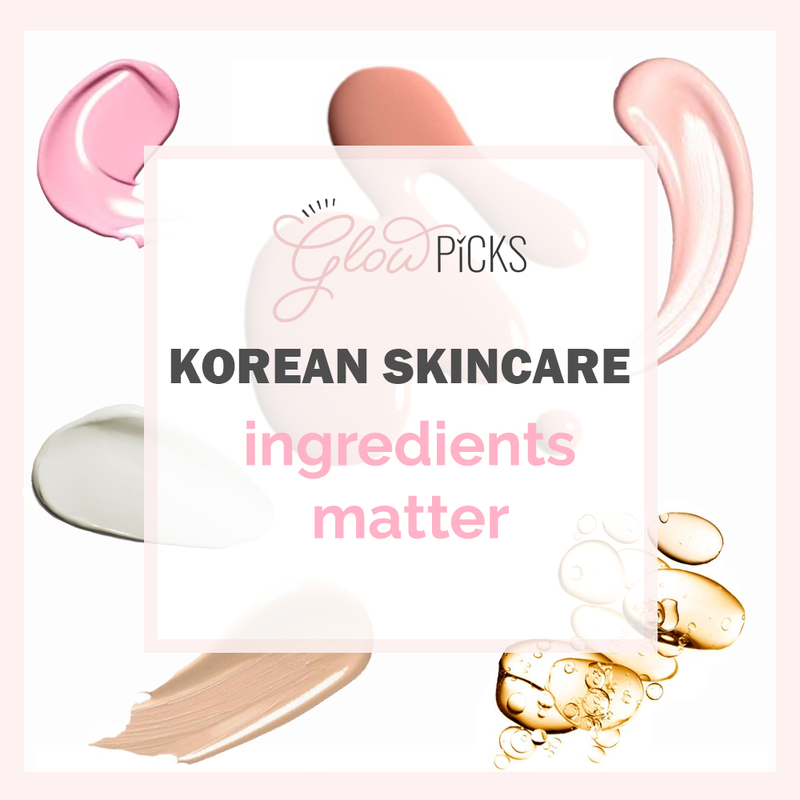 Koreans are famous for their radiating skin, but it didn’t come naturally, or as part of a slick marketing campaign, instead it’s because they take care of their skin, and carefully buy products based on the ingredients list - and not the brand name or price tag! Just because a product uses natural and organic products, that doesn’t mean it is automatically great for your skin! If you want to achieve flawless pin-up skin, then you need to watch out for products which mention they are “Free Of” something. This lists products they don’t contain such as “sulfate-free” or “paraben-free” , but doesn’t mention all the nasties which it does! It might sound strange that something natural or organic, could be bad for you, right! But the only way to find out is to check the ingredients list yourself. Do you suffer from acne or have sensitive skin? What a nightmare! One way to overcome this is to find out which ingredients cause your skin irritations, instead of just assuming that a premium price tag means a superior skincare product. If the Government sets rules and policies for cosmetics and personal products, then they must surely be safe to use, right? It sounds strange to think otherwise, but if you research it, you may be shocked to find that there is no way for a regulatory agency to check if a product is compliant or not. This means that the major cosmetic companies themselves say whether they are complying with the rules and regulations, wow! To confuse people, these rules and regulations are different in every single country! So what is found safe in one place, is considered toxic in another, what!?! Did you know that, in South Korea, Reckitt Benckiser sold deadly sterilisers which killed 100 people, even though they were legally cleared and compliant for sale? And In the European Union, the use of Talc, which is used in baby powder and cosmetics, is banned due to its risk of causing ovarian cancer. However, in Korea and EWG, it is deemed perfectly safe for use. Can you trust that your Government has the right guidelines in place to protect your safety, rather than profits of huge companies? Don’t risk your health! When you go to the pharmacy, excited to buy new cosmetics to give you that silky soft skin for an upcoming party that turns heads when you walk in the room, are you often drawn to the luxury brands with the superior price tags? It’s an easy trap to fall into; expensive must be higher quality hey? Premium yo! Well, not always. Instead, it’s the ingredients which matter, seriously! Check them for yourself! If you want to get the best value for your hard earned-money, then inspecting the ingredients, and not the brand or price tag will give you perfect skin. Did you know that a test was undertaken where a journalist applied La Mer to one side of her face, and Nivea to the other, and she noticed that over time the cheaper Nivea had more of a face lifting effect than the way more expensive La Mer. Surprised? Well, it turns out that both products use surprisingly similar ingredients such as use Mineral Oil (Paraffinum Liquidum), Glycerin, and Lanolin Alcohol. 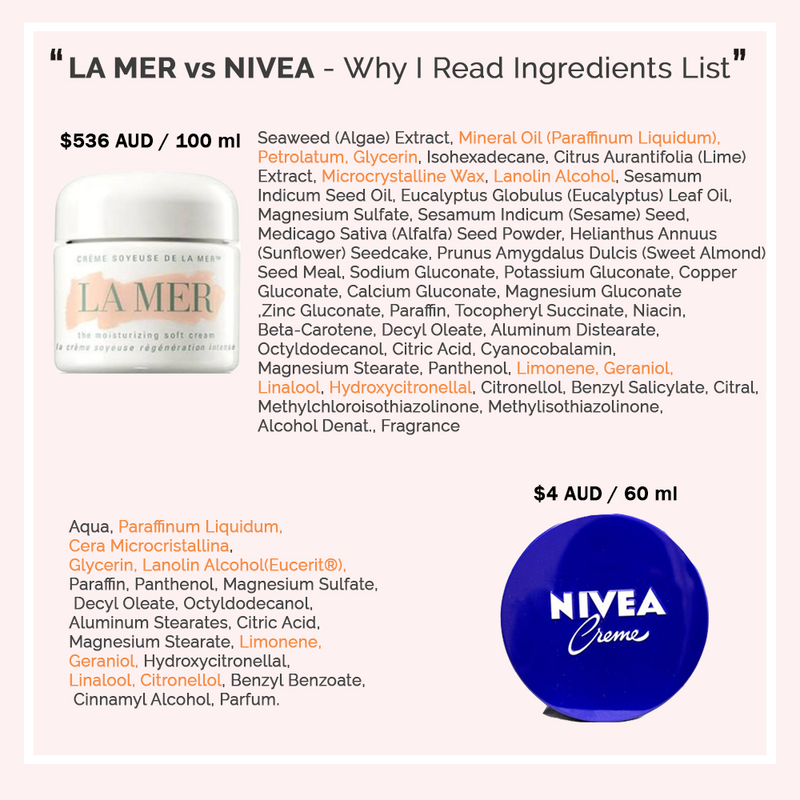 This means that because Nivea’s ingredients are similar to La Mer, and contain less harsh and nasty ones, you can achieve better results based on what is actually in the ingredients, instead of which has the higher price. See below comparison of the ingredients. Orange highlighting the same ingredients in both. You can save more of your hard earned money and achieve better results, now that is a miracle! It’s shocking how many people believe that Korean skincare products are more effective than other products, and work exactly as advertised. Does this sound familiar? Well, I’ll let you in on a little secret - it’s the ingredients, for both Korean and Western products, which actually makes a product work to reach your special goals. It’s true that the Korean cosmetic industry is more advanced, and the products may be more effective, but this is only achieved by using special ingredients, combined with an innovative process and patented complexes. An Example: A product which claims to be anti-ageing depends on some factors such as the choice of wrinkle fighter, and if that ingredient is included in either a large or small portion. To determine how much is used, check the ingredients to find out - they are listed in descending order (largest to smallest). One of the major reasons why Korean skincare products have taken the world by storm and reached cult status is partly because so many Korean people have truly flawless and gorgeous skin. However, it is not just the products themselves which offer a magic solution. Korean people put in a large amount of dedication, time, and effort to researching high-quality products and a beauty routine which compliment and work with their skin. A combination of both is required to achieve the same results. What a nightmare going through the ingredients of every skincare product! Luckily there is an app Hwahae which is dedicated to analysing the list of ingredients of Korean Skincare products in the market to find products which use non-toxic safe and effective ingredients. If you have sensitive skin or are acne prone, knowing which ingredients are in the skincare products you use is especially important, as is knowing which ingredients cause a reaction with your skin. Pro Tip: Set up a list of ALL the ingredients of the products that you use in a spreadsheet, and then over time, you can trace a certain ingredient, rather than a product, which causes you skin reactions and rashes. While it’s not fun, it will make sure you don’t buy products in future which contain nasty ingredients which can damage your skin, and also save you money too! 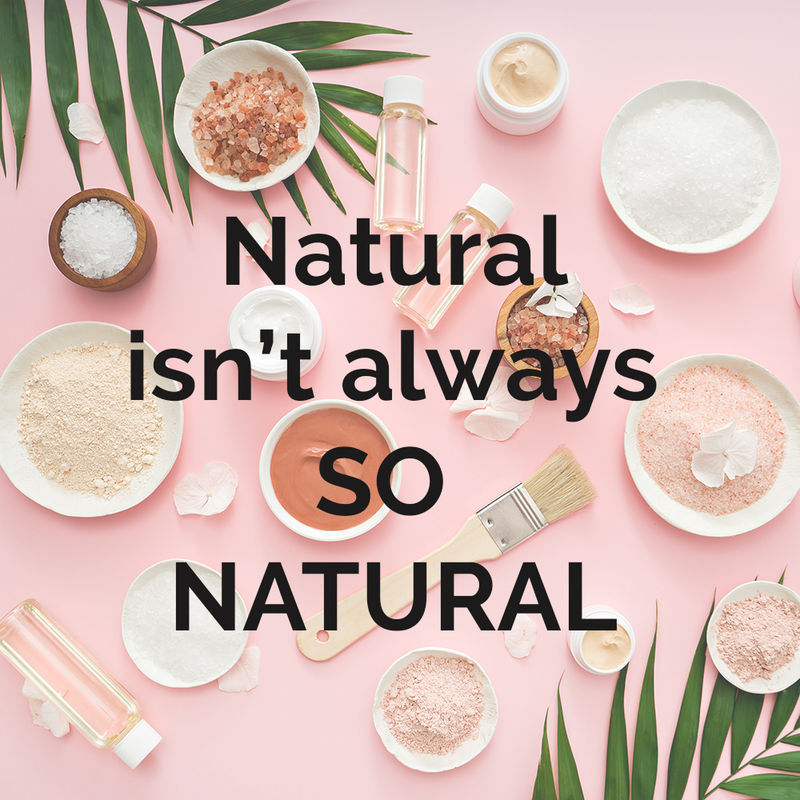 While natural and organic cosmetics products may seem like they are great for you and your skin, not all natural products contain 100% natural ingredients. Moreover, many natural ingredients can be quite harsh and lead to skin reactions and allergies. Ouch! At Glow Picks, we do have a preference for natural and organic products. However, these products do not always work for each individual, as some people can have skin reactions to natural ingredients. To find out if a product is truly natural and organic, you must first check the full ingredients list, as well as seeing if these ingredients actually work with your skin type. Analysing ingredients is the only way to discover this, and can help you find the right products with the best mix of ingredients for your skin type in future. Having trouble trying to work out which ingredients are good and bad? Confused what the ingredients actually are? Well, Glow Picks make it easy in a way which you can understand, through a personal consultation where we fully analyze the ingredients of products, to determine which are the cause of skin irritations, as well as pinpointing which ingredients don’t work based on your skin and history. All of the products sold at Glow Picks are based on how efficient they are, as well as how safe the full ingredients list is, and they will not cause harsh reactions. Your skin and health come first. We got you! Once you start to believe that it’s ingredients, and not marketing, price, or a brand which can give you the results you always dreamed of, then it’s possible to make your wildest skin dreams a reality! Do you want to find out whether your beauty items serve to achieve your skin goals? Let us know in the box below. We’ll let you know!